b. 03/02/1844 Kingstown, County Dublin, Ireland. d. 04/03/1932 Victoria, London. James Henry Reynolds (1844-1932) was born on 3rd February 1844 at Kingstown, Dublin, Ireland, the son of Mr L Reynolds JP, of Dalyston House, Granard, Ireland. Educated at Castle Knock School, Dublin, he obtained his Bachelor of Medicine and Bachelor of Surgery from Trinity College, Dublin in 1867, before joining the Army Medical Department on 31st March 1868, as an Assistant Surgeon. In 1869, he transferred to the 36th Regiment of Foot as their Medical Officer. He then received the thanks of his Commander-in-Chief, Lord Sandhurst, for his services during a severe outbreak of cholera in the 36th Regiment in India between 1869-1870, after which he was invalided home. He became a Surgeon on 1st March 1873. He arrived in South Africa in August 1874 and later accompanied the 1/24th on the minor expedition to the Diamond Fields in 1875. He served alongside both the 1/24th and 88th Regiments during the Eastern Frontier Campaigns of 1877-1878, and was present at the action around Mpetu in January 1878. By the 22nd January 1879, he found himself in charge of the field hospital at Rorke’s Drift Mission. Throughout the night, he exhibited constant attention to the wounded under heavy Zulu fire. He also volunteered to convey ammunition from the store to the defenders of the hospital, whereby he exposed himself to a cross-fire from the enemy both in going and returning. His Victoria Cross was gazetted on 17th June 1879, and just under a month later, on 16th July 1879, he was presented with his medal by General Sir Garnet Wolseley at St Paul’s Mission Station, KwaZulu Natal. 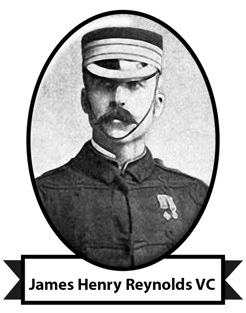 The British Medical Association gave him their Gold Medal for his services at Rorke’s Drift. He remained at Rorke’s Drift for a few weeks after the action, looking after the wounded. After the action, he was promoted to Surgeon-Major and was present in the British camp at Fort Nolela for the final battle at Ulundi in July 1879. Upon his return to Ireland he was appointed S.M.O. for the expedition to aid Captain Charles Boycott, during the so called Irish Land War of 1880. Later that year, he married Elizabeth, daughter of a Dr McCormick. He was promoted to Lieutenant-Colonel in April 1887, and obtained a brevet Brigade Surgeon Lieutenant-Colonel in 1892. He retired from the army after 27 years’ service with the rank of Brigade Surgeon Lieutenant Colonel in 1896. He was later Medical Officer of the Royal Army Clothing Factory in London. He attended a special dinner to honour holders of the V.C. at the House of Lords in November 1929. He died, aged 88 years, at the Empire Nursing Home, London and is buried in St. Marys Roman Catholic Cemetery, Grave no 504 R/C Section. His medals are displayed at the Museum of Military Medicine, Keogh Barracks, Mytchett, Surrey. BURIAL PLACE: ST MARY’S CHURCHYARD, KENDAL RISE, LONDON.